The County Government is fully committed in ensuring that the forest cover within the county is safeguarded. Already, the Department of Lands, Environment, Natural Resources and Climate Change has signed Transition Implementation Plans that shows the devolved forestry functions. Today, the Chief Officer LENRCC Dr. Mang’ira, Sub County administrator Mosop Mr. Chemogos and Kenya Forest Officers led by Chief Conservator Mr. Kennedy Muskiton visited Kiptangus, Kipsuswai and Kamwega areas in Nandi North forest with the aim of knowing the status of the forest. 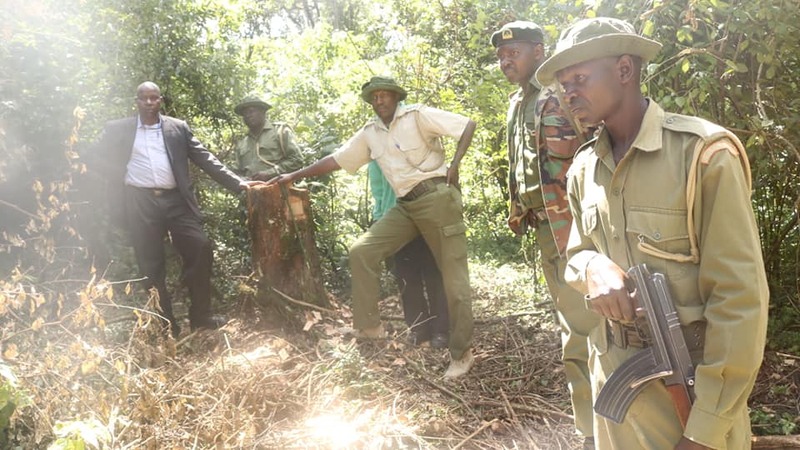 “The forest has been encroached and it is evident that the trees are being cut down for money and also for domestic use, it will not be business as usual as the destruction interferes with water catchment areas and culprits will be dealt with” Dr. Mang’ira said. In February this year, the National Government issued a National moratorium on logging activities in public and community forests.